Got to try this again, too many cars driving by, but I really like the idea behind this..., a photo by timlauer on Flickr. I have seen some shots like this up on Flickr, and the other day my wife pointed me to http://dearphotograph.com/ , a site dedicated to images constructed with old photos and the stories behind them. 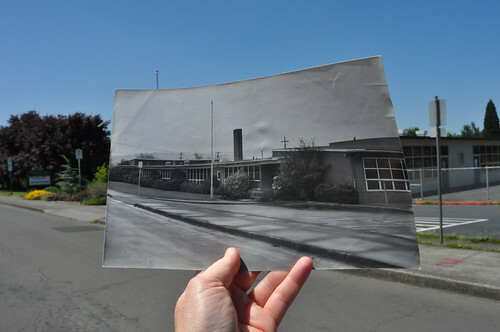 The old image of Lewis Elementary is from 1976. Was going through some old files today and found some documents that discuss the history of the school. I hope to spend some time this summer doing some research on school history. I think it is important that we and our students consider the history of our buildings, the stories they can tell and remember those that came before us.